Poor Orestes! Ever since he and his sister Electra killed their mom on the orders of a god, he can’t get no relief. Matricide-avenging Furies subject him to violent fits of madness, like a heroin addict trying to cold-turkey, and only a likely sentence of death by stoning waits to end his torment. But lo, his buddy Pylades has a plan. Forget the fact that Euripides’s Orestes was first performed more than 2,400 years ago. Anne Washburn’s new “transadaptation,” cheekily subtitled A Tragic Romp and brought to incongruous life in director Aaron Posner’s kinetic new staging at the Folger Theatre, is one of the spriest entertainments in town. Powered by Jay Sullivan’s ashen, bloodshot turn in the title role, and spiked by frequent, floorboard-threatening musical numbers via a five-woman dance-team-as-Greek-chorus, it’s as tonally erratic as it is totally awesome. Posner, the guy responsible for all the best stuff onstage at the Folger in recent years — most recently last summer’s blissful production of Tom Stoppard’s Arcadia — has largely preserved the Greek custom of having only three actors assay all the major roles, with the chorus covering for their costume changes. Though Sullivan and the unsinkable Holly Twyford negotiate their various parts gamely (Twyford plays both Electra and her grandfather, Tyndareus), Chris Genebach bears the brunt of the stop-loss. He’s persuasive as the dissembling King Menelaus and as the loyal Pylades, but it’s his early appearance as Helen of Troy, looking like drag queen in snakeskin spikes, that sets the evening’s ever-accelerating bizarro rhythms dumming. When Orestes later observes of Helen, “That woman is radioactive packet!”, what he means is she’s a Trojan War-igniting femme fatale. But the fact that The Face That Launched a Thousand Ships now sports Captain America’s jaw and an Adam’s apple doubles your funny. The otherworldly musical interludes, meanwhile, have none of the presentational, self-congratulatory quality of the songs in a traditional musical. Composed by James Sugg, who also sampled fragments of Euripidies’s text— some of them in the original Greek — for the chorus to perform a cappella, the songs feel primal and scary. When they abruptly terminate, we’re right back into the dramatic fray before all that energy can be dissipated by applause — though the chorus’s limber performance surely warrants it. 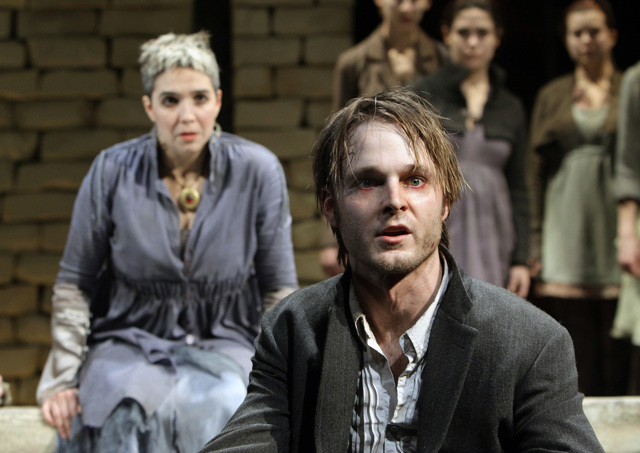 Washburn, whose credits also include The Internationalist, approached the adaptation with a free but loving hand. We might think its postmodern hyperactivity familiar from Quentin Tarantino or Martin McDonagh, but all the craziest stuff here comes straight from the source. Euripides was 73 years old and soon to withdraw from Athenian society for the short remainder of his life when he wrote Orestes. Its sense of young Greeks being unable to do right despite their obedience to their gods feels like Eurpidies’s Vonnegut-esque sendup of his own era. Back here in ours, Daniel Conway’s set places a bed of smooth, big-enough-to-hurt-you stones underfoot that crunch conspiratorially when trod upon. Along with the temple-like surroundings (though every Folger set is a little temple-like — there’s only so much you can do about those columns), they’re a constant sensory reminder that these characters are trapped between the whims of the immortals and those of their earthly brethren, so ephemeral and fragile that one unlucky footfall could do them in. Orestes, A Tragic Romp is at the Folger Theatre through March 7. This entry was posted in theatre and tagged adaptation, Greek tragedy, theater. Bookmark the permalink.